I recently visited the Jimmy Choo and Christian Laboutin footwear displays in a much-trumpeted Lower Mainland department store. When a staff person approached me, I expected the usual “Can I help you?” Instead, the young man gestured at the poppy on my lapel. “This is the earliest I’ve ever seen anyone wear one of those,” he said. Now, as a lifelong practitioner of full-frontal nerdity, I admit the finer points of fashion frequently fail me. After all, I learned only in my teens that one does not wear white after Labour Day—a lesson delivered by a snide classmate. The experience was made especially surreal by the fashion commentator’s long, stringy hair, daily uniform of faded skull-and-crossbone t-shirts and much-torn jeans—anticipating the next frayed-jean craze by about six years—and overwhelming eau de hash. November 11 marks the official end of poppy season, of course, but what signals its start? I’ve always taken my cue from when trays of poppies and donation boxes appear at checkout counters, reception desks, and bank-teller windows—usually sometime in mid-October. The website of the Royal Canadian Legion, which runs the Poppy Campaign, states that the poppy is traditionally worn from the last Friday in October to the end of November 11—a period of about two weeks. Throughout much of October this year, I noted increasingly frequent and numerous announcements for Hallowe’en events. A small prairie town where I once lived that spent more than a month preparing for October 31. Residents gussied up their houses and yards with ghosts and ghoulies immediately after Thanksgiving. Mothers competed to create costumes for their munster-youngsters, and the under-12 crowd turned out en masse to model the results and collect goodies. Then, there’s the Season-That-Lasts-Far-Too-Long. You know—the one that starts soon after Hallowe’en and goes on for months, gaining momentum and glitter until it explodes in a gluttonous frenzy of feasting and giftwrap at the end of the year. Amidst all this noise and riotous activity, poppy season quietly comes and goes. In Victoria, the pop, crackle and whistle of fireworks punctuate Hallowe’en, sending sulfurous smoke drifting, and lighting the night with flashes and flares. Such local occurrences may ever-so-slightly recall the bombardments that churned the earth of Belgium and northeastern France a century ago and created the conditions in which Europe’s wild, weedy red poppy thrived, but today’s fireworks have nothing to do with remembrance. Writers in the 1800s noted that poppies grew wherever battles had been fought against Napoleon in western Europe. After the Second Battle of Ypres, in April 1915, Canadian soldier–doctor John McCrae fashioned his poem, In Flanders Fields, around the observation that poppies bloomed on soldiers’ graves. The image struck American humanitarian worker Moina Michael, who began selling silk poppies after the war to be worn as a tribute to the fallen and to raise money for disabled servicemen. From there, the custom spread—to Britain, to France, throughout the British Commonwealth. In November 1921, the first poppy pins were distributed in Canada. Wearing a poppy now represents a visual pledge to remember those who served and fought for Canada during that war and in the years since. This year, some 18 million poppies will be distributed in Canada and overseas, and some $15 million will be raised in Canada to support programs and assist veterans in need and their families. 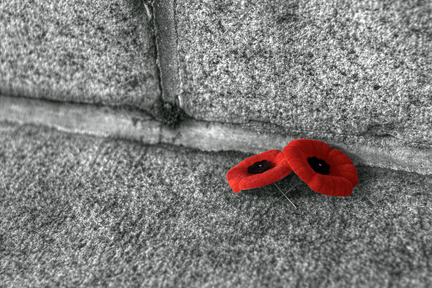 Despite that, as symbols go, the poppy remains as subdued as a rainy fall day. Although poppy season is a national campaign of remembrance and support, it is just as much about each individual poppy wearer’s own expression of respect… even of conscience. As such, it stands outside the dictates of fashion and commerce. A version of this editorial appears in the November 08, 2015, issue of the Victoria Times Colonist.